All good things must come to an end. And in the case of this teen novel series turned film franchise, it’s that time. As a fan of the book series, I have been pleased with the movies as a whole. Hunger Games was a solid adaptation that launched the career of Jennifer Lawrence. Catching Fire was a surprising improvement on the literary version. And even last year’s Mockingjay Part 1 was well crafted political commentary, albeit a relatively unnecessary creation due to the fact that it only tells half of a story. The silver lining, however, in giving the Mockingjay novel the Harry Potter and the Deathly Hollows treatment is that they saved most of the action for this installment. Mockingjay Part 2 picks up right where the previous film left off. Reluctant revolutionary Katniss (Jennifer Lawrence) is recovering from the vicious attack from her Hunger Games bff, Peeta (Josh Hutcherson), who has been tortured and brainwashed by the villainous President Snow (Donald Sutherland). But Snow, and the residents of the capitol are weakening, and with the 13 districts aligned, Katniss is ready to lead her other would-be boyfriend, Gale (Liam Hemsworth) and a host of other returning characters into the capitol to assassinate Snow once and for all. They’ll only have to navigate miles of traps and vicious creatures to do so. Like with Part 1, this film is really only half of a story. And from the start, it feels like we should be coming back from a scene change rather than starting a whole other film. But whatever Part 2 lacks in story structure, it makes up for in the substance of its characters and message. Mockingjay Part 2 may feature the greatest performances of any film in the series. Jennifer Lawrence is once again stellar, but Josh Hutcherson’s turn as a damaged Peeta is arguably the film’s most crucial portrayal. Throw in countless memorable anecdotes that leap from the pages and onto the screen with ease, and this film manages to satisfyingly hit its emotional chord. And for those who may have found Part 1 a bit dreary from an action standpoint, there is much more to be found this time around. While there are still some periods of dryness, there are enough exhilarating scenes to keep you fully attentive, particularly when Katniss and her unit are attempting to navigate the capitol. At one point as their being briefed by Commander Boggs (Mahershala Ali), former Hunger Games victor Finnick Odair (Sam Claflin) leans to Katniss and says “Ladies and gentleman, welcome to the 76th Hunger Games.” And that is exactly what the second half of the film feels like. This is the end of the Hunger Games story. So expect to say goodbye to a few familiar faces. But regardless of whether you find the ending, and the somewhat anti-climactic death of one character, to make for a satisfying conclusion (I didn’t when I read the book), there’s simply no denying how thought provoking and emotional the series is. With the help of a remarkable cast and a well crafted overall story, the Hunger Games franchise comes to an end as four films well worth the price of admission. Few cartoons or comic strips have ever been more endearing than Peanuts. Originally created by Charles M. Shultz, these cartoons have been a staple for family fun and holiday entertainment for 65 years. It only seems right to bring loveable loser Charlie Brown and his imaginative, eclectic canine pal, Snoopy to the big screen. 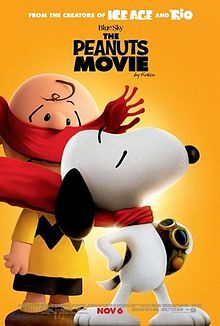 The Peanuts Movie, directed by Steve Martino and written by Chultz’s son and grandson, follows Charlie Brown as he embarks on a journey to gain respect from his classmates and gain the affection of the new girl in school. Meanwhile, Snoopy and his bird pal Woodstock try their hand at writing a novel. Along for the ride are all of the classic Peanuts characters: Piano playing Schroeder, know it all bully Lucy, wise, blanket toting Linus, tomboy Peppermint Patty and her brainy assistant Marcie, and Charlie Brown’s spunky sister Sally. If you’ve ever been a fan of Peanuts then there is absolutely nothing to dislike about this movie. It is as witty, charming, and as downright goofy as the best Charlie Brown comic strips and TV specials. It is the perfect family film for anyone from ages 3 to 93. While it certainly seems lengthy in relation to the TV movies you might’ve become accustomed to, the payoff is more than worthwhile. The only negative part of the experience is the insufferable Ice Age short that appears before the movie starts. The animation is also stellar, blending the classic style of Shultz’s original artwork with impressive modern age computer generated technology. Blended with a fine soundtrack and the fact that Charlie Brown is just a wonderful character who brings a positive message, The Peanuts Movie is a must watch for anyone who wants to enjoy a movie with a little one or who just wants to embrace their own inner-Charlie Brown. It’s hard to follow up a classic. The Dark Knight Rises was never going to be as good as The Dark Knight, and if you didn’t accept that going in, then you were probably setting yourself up for disappointment. The James Bond franchise spans over 50 years and 24 films. 2012’s Skyfall might’ve been one of the best entries of them all. With a stellar cast, solid story, exhilarating action, and memorable villain, it cemented itself as one of the best Bond films in recent memory and set the bar high for any film to follow. Spectre brings back most of the people that made Skyfall a classic. Director Sam Mendes returns along with Daniel Craig who stars as James Bond for the fourth, and perhaps final, time. Also returning are Ralph Feinnes as M, Naomie Harris as Moneypenny, and Ben Winshaw as Q. Clearly, the pieces are all here to make Spectre another phenomenal film, but unfortunately that isn’t the case. 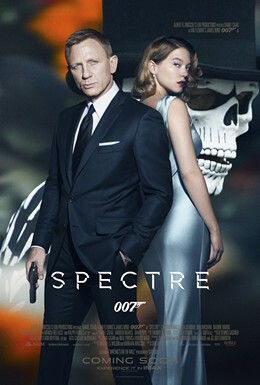 The film’s plot revolves around an undercover mission given to Bond by the now deceased former M (Judi Dench) that leads him up against the evil organization SPECTRE and its mysterious leader (Christolph Waltz). With the help of the daughter of one of the organization’s ex-members (Lea Seydoux), Bond must bring down the organization before they manage to infiltrate major government agencies around the globe. Any Bond enthusiast, like myself, will recognize the name of the organization as the classic overarching nemesis of the 60’s and 70’s James Bond films. And there are loads of moments in the film that pay direct homage to those films. The problem is, too much of the film plays out like this. Daniel Criag’s Bond films (Casino Royale, Quantum of Solace, Skyfall) all have made their mark in the franchise by managing to sway from Bond film clichés while still keeping the character true to form. And yet, Spectre feels like one of the most predictable spy films in years from the plot to the villain. That is not to say that Spectre isn’t an enjoyable movie. The action sequences, many featuring Guardians of the Galaxy’s David Bautista as an assassin, are all beautifully shot and executed. There is also undeniable chemistry between all of the members of the lead cast and it’s hard not to love Daniel Craig as James Bond. But, from the opening chase sequence and Sam Smith lead theme song to the climactic showdown between Bond and Christoph Waltz’s formulaic villain, everything just seems like a step down from Skyfall. If you go in expecting an upgrade or even a film better than Mission Impossible: Rogue Nation, you might feel slighted. If you’re going in just to be entertained by James Bond doing James Bond things… well then… enjoy!